UFC 2 marked the only time in history that the UFC held a sixteen-man tournament. 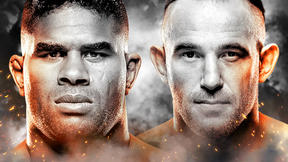 Watch as one fighter would battle through 4 matches in one night to earn the $60,000 grand prize. 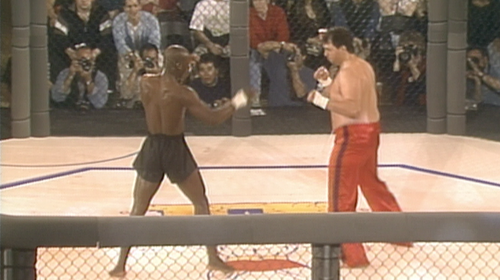 Royce Gracie vs Pat Smith UFC 2 Fri, Mar 11, 1994 (11:45) Neither faltered for a moment in the lead-up, as both kickboxer Patrick Smith and BJJ blackbelt Royce Gracie tore through the tournament's competition to reach UFC 2’s finals. Pat Smith vs Johnny Rhodes UFC 2 Fri, Mar 11, 1994 (7:49) In UFC 2’s semi-finals, both Patrick Smith and Johnny Rhodes entered the Octagon confident following one stoppage victory due to strikes and one via choke. There was much anticipation in the air as the two kickboxers proved they could fight anywhere. Royce Gracie vs Remco Pardoel UFC 2 Fri, Mar 11, 1994 (6:27) As this dynamic grappling duo came off of highlight reel victories in their quarterfinals bouts, the much larger Remco Pardoel looked to test his judo against UFC 1 champion Royce Gracie’s jiu-jitsu. Pat Smith vs Scott Morris UFC 2 Fri, Mar 11, 1994 (5:42) In the first quarter-finals bout of UFC 2, riding high on their Octagon victories earlier in the evening, which were both via guillotine choke kickboxer Patrick Smith targeted ninjutsu master Scott Morris. Johnny Rhodes vs Fred Ettish UFC 2 Fri, Mar 11, 1994 (8:18) After suffering an injury in his winning/only UFC performance, Frank Hamaker was replaced by mustachioed karate fighter Fred Ettish. On incredibly short notice, Ettish took to the Octagon to take on quarterfinalist kickboxer Johnny Rhodes. Remco Pardoel vs Orlando Weit UFC 2 Fri, Mar 11, 1994 (6:37) Dutch judo player Remco Pardoel entered the Octagon to prove Muay Thai wasn’t the only martial art in Holland and who best to test himself against than vicious Thai striker Orlando Wiet. The result is one of the most devastating finishes in UFC history. 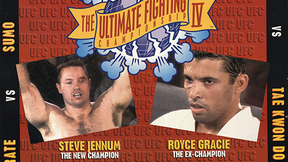 Royce Gracie vs Jason DeLucia UFC 2 Fri, Mar 11, 1994 (2:30) Royce Gracie looked to add to his string of jaw-dropping submission victories as he took on light heavyweight kung fu guru Jason DeLucia in the quarter-finals of UFC 2. 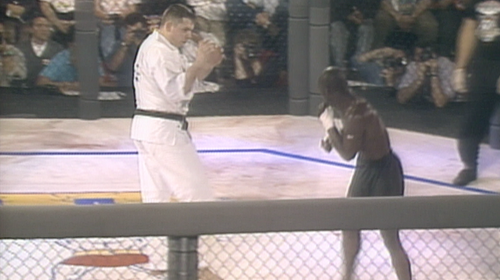 Scott Morris vs Sean Daugherty UFC 2 Fri, Mar 11, 1994 (4:58) A battle of one hit wonders, Scott Morris and Sean Daugherty answered the UFC’s call to test themselves inside the ultimate proving grounds as the 18 year old Daugherty’s taekwondo took on Morris and his “ninja” skills. 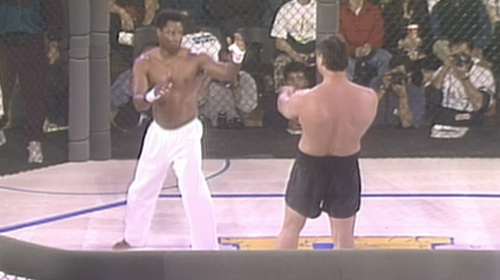 Pat Smith vs Ray Wizard UFC 2 Fri, Mar 11, 1994 (5:49) Making a return appearance to the Octagon, kickboxer Patrick Smith was ready to use what he learned from competing at UFC 1 against the karate fighting newcomer Ray Wizard. 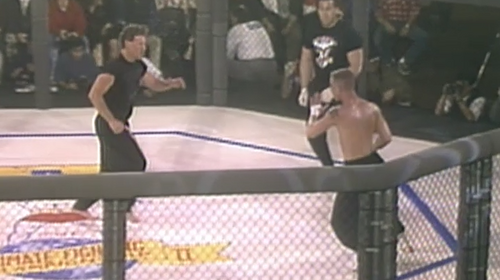 Johnny Rhodes vs David Levicki UFC 2 Fri, Mar 11, 1994 (18:37) By far the longest bout in UFC history at the time, Wing-Chun Kung Fu fighter David Levicki battled kickboxer Johnny Rhodes for an unprecedented 12+ minutes. Also, memorable for its unusual need for referee “Big” John McCarthy’s hands-on interference. 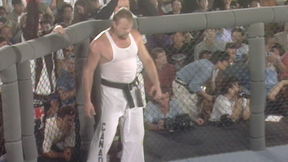 Frank Hamaker vs Thaddeus Luster UFC 2 Fri, Mar 11, 1994 (9:30) Octagon newbies were set to scrap, Amsterdam's Sambo specialist Frank Hamaker was set for action against California’s Kung Fu fighter Thaddeus Luster. Orlando Weit vs Robert Lucarelli UFC 2 Fri, Mar 11, 1994 (5:48) An international clash of styles as New York native wrestler and boxer Robert Lucarelli delivered an exciting back-and-forth banger against Suriname’s Muay Thai veteran Orlando Wiet.